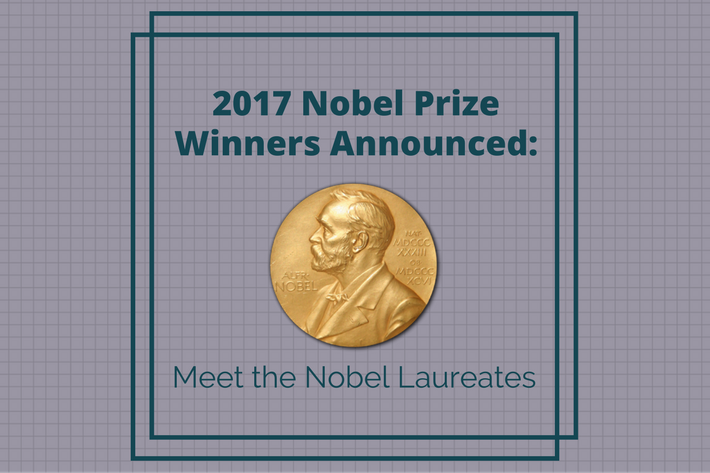 The most famous and prestigious prizes in research, the Nobel Prizes, were announced recently. The prizes for 2017 will be given out at a ceremony in Stockholm on the 10th December. Before that happens, we're going to introduce you to each of the winners and explain what part of their research lead them to win an award for their extraordinary achievements. These three colleagues from LIGO, the Laser Interferometer Gravitational-Wave Observatory, were jointly given the award for their work on the observation of gravitational waves. The LIGO observatory project has been running for nearly 50 years and it finally achieved its aim of detecting the tiny fluctuations which demonstrate the existence of gravitational waves for the first time. The three winners were responsible for the design of the detector and the interpretation of the results. The three researchers from Switzerland, USA, and UK were given the award for the development of cryo-electron microscopy. This imaging method can visualize biomolecules in a new way, by freezing the molecules while they are mid-motion to allow researchers to see processes as they happen. It had been previously thought that electron microscopes could only be used on dead matter, but through the combined efforts of the prize winners it has become possible to image living cells too. The prize for medicine is shared between two researchers who made discoveries of the molecular mechanisms which control circadian rhythms. Circadian rhythms are the changes in a organism's blood pressure, hormone levels, blood sugar levels, or other physiological factors over the course of a 24 hour day. The inner clock of organisms is regulated through a particular gene which was discovered and isolated by the prize winners. English author Kazuo Ishiguro was awarded the literature prize in recognition of his career as one of the most highly regarded figures in modern literature. The prize committee described his writing as “novels of great emotional force”, noting that in his writing he “has uncovered the abyss beneath our illusory sense of connection with the world”. The peace prize went to ICAN, an international organisation which aims to stop the proliferation of nuclear weapons and discourage governments from stockpiling or using them. Although there are international prohibitions against the use of land mines, cluster bombs, and biological or chemicals weapons, there are currently no prohibitions against the use of nuclear weapons, and ICAN have campaigned prominently for the prohibition of nuclear weapons. Economics prize winner Richard Thaler was recognised for his work in behavioural economics, combining the fields of economics and psychology. Best known to the public for his book Nudge, Thaler worked on the topics of limited rationality (that is, how people perform financial decision making by focusing on the narrow impact of a decision rather than the broader impact, called mental accounting), social preferences (how consumers respond to issues of fairness, such as the fact that consumers will accept raised prices due to rising costs but not due to high demand), and lack of self control (looking at how and why we tend to succumb to short-term temptations over long-term planned goals). This work has been key to the founding of the field of behavioural economics. What Should Women Wear To Academic Conferences?